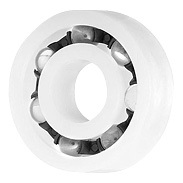 Plastic bearings are used in wet and corrosive environments, clean environments, areas that are difficult to lubricate, and applications that require non-magnetic bearings. They are made from a variety of plastic materials and are often self-lubricating to provide smooth operation and greater durability. Polytetrafluorethylene (PTFE), a heat-tolerant polymer, is a fluorinated thermoplastic with outstanding chemical resistance, low leachability, and excellent lubricity.